Social media results less than stellar? We’ll let you in on a little secret: it’s not all that hard to fix (usually). In this article, we tell you how to do a social media competitive analysis. With this data, you will be back on track fast. How to do a Social Media Competitive Analysis? This article will take you through all the steps needed to perform a social media competitor analysis. Because someone in your industry has already cracked the code on how to achieve success through social media. Your job? Find that person (they’re your competition). With a little sleuth work and lot of help from analytics tools, you’ll have an all-access pass to what makes their pages work, and how you can adapt their success into your own strategy. Why do a Social Media Competitive Analysis? Because the majority of the time, you’re not trying to reinvent the wheel. You’re just tweaking it a little. A social media analysis will give you insight into how your competitors’ are using social media — which channels work best, what content they share and how it performs. So rather than starting from scratch, learn from what worked (or just as important – didn’t work) for them. It’s ethical spy work that will save you time, money, and plenty of headaches. Step 1: Identify Competitors to do a Social Media Competitive Analysis? The first step is to find out who you’re up against. This is easier for some than others, depending on your niche. But everyone tends to start at the same place: Google. A good ol’ Google search into the keywords or phrases (and location, if applicable) most associated with your niche will give you immediate insight into your most recognizable competition. Or, try tools like SpyFu. SpyFu will quickly identify the top keywords – and competitors – associated with any domain name. So once you have a few on hand from your Google search, simply type one of the domains into the SpyFu search bar. From there, you’ll be taken to a monthly overview. Scroll down a little to find the competitors section, where it will list the domains top organic and paid competitors. Because you’re focusing specifically on social media, your work isn’t done yet. You can choose to manually search for each competitor’s social presence, or you can cut your work in half by using a tool like Rival IQ. 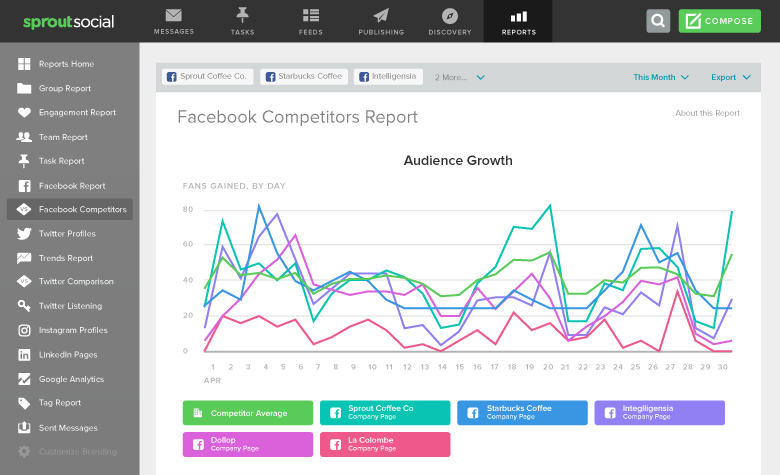 With Rival IQ, you’re able to create “landscapes” that analyze your competitor’s social media presence. (Bonus: they offer a free 14 day trial). In your landscape, enter your URL and those of your top competitors. Rival IQ will return with all the active social media sites your competitors use. It will also tell you which networks they have the largest audience on. This is a crucial step because by knowing where your competitors are performing best, it will help you determine which social sites are best for your business. One thing to keep in mind: keep your competitor count short. Sprout Social recommends aiming for around 5 competitors, while Hootsuite recommends 3-5, so make sure you scale your list down to a manageable size. There are so many more tools! I can’t cover them all right now, you can read about them here though. Now that you’ve identified your top competitors and where they’re hanging out on social media, it’s time to take a dive into the data. This is the meat of the analysis, and you’ll want to take your time looking at each platform and how your competition performs. And while anything with ‘data’ in it can seem daunting, you’re not alone. There are plenty of tools to help. You’ll want to begin by finding which channels have the highest engagement. If you did happen to use Rival IQ, you’ll have access to charts for Social Activity and Social Engagement. Here, you can see which sites yield the highest engagement rates. This, more so than audience size, is a key metric to focus on. As you know, audience engagement is far important than size when it comes to marketing. Other online tools like Fanpage Karma and Simply Measured will analyze and compare your social media pages to your competitions, making it easy to track user engagement levels, top posts, and best times to post. From there, the process will differ depending on which social sites you’re targeting. For our purposes, we’ll go through the big three: Facebook, Twitter and LinkedIn. What This Tells You: Paying attention to the above will tell you how many people are actively looking and interacting with a brand’s’ page, and how continuously that audience is growing. Which Tools Can Help: Luckily, you have your choice in the matter when it comes to tools. SproutSocial’s Facebook Competitor’s Report is built specifically for competitor analysis, and allows you to track fan growth by the day, inbound and outbound messages, engagement by post, and the type of the content they’re posting — text, images, or videos. Fanpage Karma is another good one here, as its biggest strength is Facebook analytics. What This Tells You: Like Facebook, you’ll be able to see how many interact with each brand’s Twitter page, and which kinds of posts get liked and shared the most. Which Tools Can Help: Again, there are plenty to choose from. Keyhole is a great place to start. The tool works well for both Twitter and Instagram, and allows users to search for hashtags and keywords. Its dashboard will identify top influencers, posts, reach and top pages. Tweetreach is another Twitter-centric tool that will allow you to collect competitor data, and Sproutsocial also offers a Twitter Comparison Tool. What This Tells You: The above metrics show you what works for this Instagram audience (the same one you’re trying to tap into), and also gives you an idea of what topics and trends are popular in your industry. Which Tools Can Help: We already mentioned the dual benefits of Keyhole. Another highly effective tool is Talkwalker. It will give you analytics for all the major platforms, but works especially well for finding out what’s working for your competitors on Instagram. It’s Themes sections will give you an idea of what’s trending, was trending and will be trending in the future. You can do the same for hashtags, and find out which posts are performing the best. It will also allow you to directly compare your account to competitor’s, showing their post frequency, their engagement rates and reach. Best channels to use: Remember, focus on the channels that have yielded the highest engagement rates for your competitors. They may have millions of followers, but it means nothing if those followers don’t interact. Audience Growth: How quickly have their audiences grown over their popular platforms? This will help you set a benchmark for your own growth goals. Top Posts: What are your competitors posting? Are they photo or video driven? By analyzing what’s worked for them, you can form a strategy that incorporates their successes into your own content. Equally important are the posts that don’t perform well; analyze them to give you an idea of what to avoid. Engagement Rates (Overall and Per Post): We can’t stress this enough: pay special attention to any posts that have received an above-average amount of engagement. These are the ones that resonate the most with customers, and the ones you want to emulate in your own strategy. Post Frequency: How often are they posting to each site? Try to find a correlation between the competitors to determine the frequency that works best for your industry. All the numbers in the world can’t replace the ‘human’ element. Which is why it’s important to look beyond the data and pay attention to how your competition engages. So we listen. Listening is social media speak for monitoring an account (ie spying). Simply taking the time to scroll through your competitors posts will give you an idea of how they connect. Do they use humor? Funny videos? Do they ask for audience input through polls or public questions? Do they share mostly their own content or follow the 80/20 rule? One of the biggest decisions a brand must make — especially with social media — is determining their voice; whether they will keep it strictly professional or try a more personal or playful tone. By determining what your competition is saying and how they’re saying it, you’ll have a better idea of how to talk to you audience in a way that will make them talk back. To determine your brand’s place and position in the social world, sometimes it’s best to go old school with a SWOT analysis (or the essence of one). The SWOT analysis looks at strengths, weaknesses, opportunities, and threats. When done correctly and in conjunction with an analysis of your own brand, it will give you an idea of how you should position yourself in the market. It doesn’t have to be done in the traditional 4 quadrant SWOT style, but the main points should be addressed. Learn from competitor’s strengths, but pay special attention to their weaknesses and opportunities. If you can correctly identify their weaknesses based on your social media competitor analysis, you’ll have the opportunity succeed where they’ve fallen short. Get Started Doing a Social Media Competitive Analysis? When it comes to social media, the best way to learn is from those who have done it before you. A competitor analysis is a highly effective way to do it. Remember, you’re not out to copy their strategy, just adapting what they’ve done well into a strategy of your own to ensure your content is up to par. After all, isn’t imitation the sincerest form of flattery?